This Chakra Series of seven guided meditations is an exploration of the ancient Chakra system of energy centers using the Internal Family Systems model. Chakra means wheel in Sanskrit. Exploring the Chakras addresses the most powerful and vital energy centers in the body. Each chakra is a meeting point of millions of energy channels or nadi. 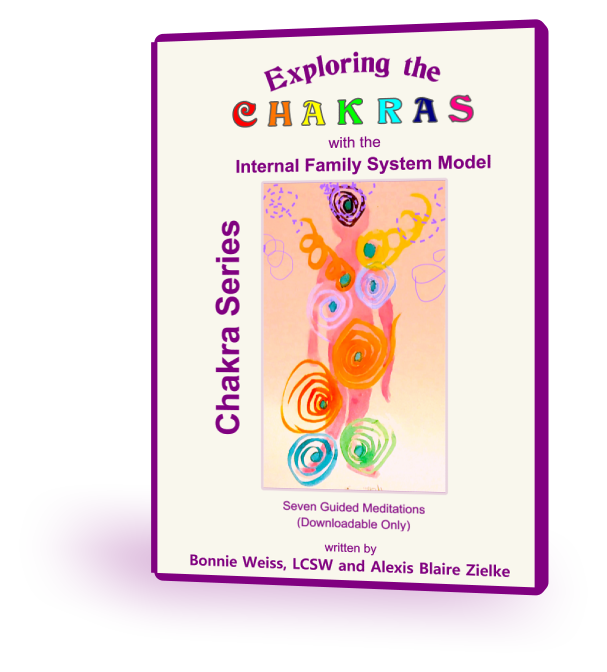 Using the Internal Family Systems model, these meditations dive in to explore which parts of you reside in each chakra with a focus on bringing Self-energy to those parts. Who are the parts that live in your chakras? What are their belief systems? What are the capacities, skills and talents ignited by the light of your chakra system? Using the Internal Family Systems model, this meditation dives in to explore which parts of you reside in your first chakra, located at the base of your spine, with a focus on bringing Self-energy to those parts. Using the Internal Family Systems model, this meditation dives in to explore which parts of you reside in your second chakra, located at your lower abdomen, with a focus on bringing Self-energy to those parts. Using the Internal Family Systems model, this meditation dives in to explore which parts of you reside in your third chakra, located at solar plexus, with a focus on bringing Self-energy to those parts. Using the Internal Family Systems model, this meditation dives in to explore which parts of you reside in your fourth chakra which includes your heart, chest, and Lungs, with a focus on bringing Self-energy to those parts. Using the Internal Family Systems model, this meditation dives in to explore which parts of you reside in your fifth chakra, which includes the throat, ears, arms, and fingers, with a focus on bringing Self-energy to those parts. Using the Internal Family Systems model, this meditation dives in to explore which parts of you reside in your sixth chakra, located at your third eye (center of the forehead), with a focus on bringing Self-energy to those parts. Using the Internal Family Systems model, this meditation dives in to explore which parts of you reside in your seventh chakra, located above the crown of your head, with a focus on bringing Self-energy to those parts.